The Bike Law University is a resource series created by the League to present state traffic laws related to bicyclists in a reader-friendly format. These resources give greater depth and context — including comparative charts — to our state law resources and our Bicycle Friendly State rankings. What is the law being discussed? Why should you, as a bicyclist, care about it? Which states have the law being discussed? Where did this type of law come from? A spotlight state that highlights the issues embedded in each type of law. The Comparative Charts provide citations and tables that show common features for each type of law and which states have which features. Click on a topic below to see how your state's laws compare to the laws in the other 49 states. What are Safe Passing Laws? Safe passing laws require vehicles to pass each other at a safe distance. In most states, the amount of space necessary to be “safe” isn’t defined, but, in a growing number of states, there are laws that say a safe distance between a bicyclist and a motorist is not less than three feet. A safe passing law is valuable because it raises awareness as to how vehicles should share the road. It may also lead to enforcement actions against unsafe passing or be used in legal actions resulting from collisions or other incidents between road users. All states have some version of a safe passing law. In 42 states, and the District of Columbia, the safe passing law explicitly mentions bicyclists. In the other 8 states, bicyclists are usually protected by safe passing laws written with no distinction between bicyclists and other road users. In 33 states, and the District of Columbia, there is a defined distance standard — typically three feet — which sets the minimum distance required for safe passing. The other 16 states do not define what constitutes a safe distance in terms of feet. There are four states – Oregon, Rhode Island, Washington, and Vermont – which have laws that do not define a minimum safe distance in terms of feet, but are significantly different than the Uniform Vehicle Code in a way that provides more protection to bicyclists. There are also several states, including South Dakota and North Carolina, that provide for minimum safe passing distances of more than 3 feet in certain circumstances. There are 2 states - Kentucky and Nevada - that require motorists to change lanes to pass bicyclists when a road has more than one lane for travel in the direction the motorist is going. Delaware requires drivers to change lanes to pass bicyclists even when there is only one lane for travel in the direction the driver is going whenever the travel lane is too narrow for the driver's vehicle to travel safely side-by-side with within the lane with a bicycle. The first state to pass a three foot law was Wisconsin in 1973. Safe passing laws that do not define a distance are generally derived from the model laws found in the Uniform Vehicle Code (UVC), which was last updated in 2000. There are three UVC sections that have an impact on safe passing laws. If you would like to know more about safe passing in your state, or you are considering new legislation in this area of law, finding your state’s equivalent statutes for the following UVC sections would be a good place to look. UVC 11-303: Overtaking a Vehicle on the Left – This section is the source of the safe distance language used by a majority of states. UVC 11-305: Limitations on Overtaking on the Left – This section generally deals with crossing the center-line of the roadway in order to pass another vehicle. Crossing the center line can be relevant to safe passing laws because a vehicle may have to cross the center line in order to provide a safe distance while passing, therefore it is important that vehicles are allowed to do so. UVC 11-306: Further Limitations on Driving on Left of Center of Roadway– This section deals with crossing the center-line of the roadway in order to pass when there are specific road circumstances that compromise visibility. Since it only applies when there are specific road circumstances, like a curve or slope that may affect visibility, it is less likely to create problems when interacting with a safe passing law. View the state-by-state chart here. Automobiles provide a shell of protection for their users — creating a safety disparity between cars and other road users. This is not to say non-automobile forms of transportation aren’t safe, but simply that there is a difference between what occurs when a car is hit at 25 miles-per-hour and what occurs when a pedestrian is hit at 25 mph. While the percentage of motorist deaths has fallen, the percentage of road fatalities that are bicyclists and pedestrians has grown in recent years (from 12 percent to 16 percent). Vulnerable Road User laws increase protection for bicyclists and other road users who are not in cars. They are relatively new and states have chosen to protect vulnerable road users in a variety of ways. This usually involves 1) harsher penalties for the violation of existing laws when that violation impacts a defined set of road users or 2) the creation of new laws that prohibit certain actions directed at a defined set of road users. Safety: The vast majority of VRU laws provide for increased fines or civil liability in cases where a vulnerable road user is injured or killed because of negligence or as the result of a traffic violation. These laws increase the cost of unsafe practices that impact bicyclists and provide an incentive for safer driving practices, especially around cyclists and pedestrians. In this way the laws are much like increased fines in work zones, which promote construction worker safety. VRU laws recognize that the type of simple negligence or traffic violations that may result in minor collisions between cars can have disproportionately severe results when a vulnerable road user is involved and provide ways to address those divergent results. In some states VRU laws include the option or mandate that a person convicted of injuring or killing a vulnerable road user attend a hearing. Without these laws, a driver who injures or kills a bicyclist may simply pay a fine through the mail — despite the severity of the impact of his or her actions. These hearings can provide a chance for both sides to meet and tell their stories, similar to victim impact panels that are a feature of DUI offenses. The League believes the experience of a hearing is a valuable tool for addressing the separateness between motorists and bicyclists — and endorses requiring a hearing as part of our Model Legislation (http://www.bikeleague.org/legacy/action/bikelaws/modellaws.php). VRU laws may be an important and effective part of messaging about road safety. The VRU concept is inclusive and multi-modal. It provides a messaging and legal framework for a wide range of advocates interested in road safety that highlights and increases awareness of the inherent safety disparity between road users encased in a protective shell and those who are not. As a newer concept, it has the potential to engage law enforcement, judges, and juries in a way that they have not been been before and shift perceptions. While these individuals or groups may not always understand what it is like to be a cyclist, at one time or another everyone has been a vulnerable road user. A VRU law may increase access to justice. Vulnerable road users, unlike automobile users, may lack the evidence and expensive property damage that is created in a car crash. Statutory civil penalties may provide an incentive for lawyers to work with vulnerable road users to recover damages and recognize the seriousness of vulnerable road user crashes. Criminal penalties provide an additional enforcement tool for police and a framework for better traffic enforcement. 9 states – Connecticut, Delaware, Florida, Hawaii, Maine, Oregon, Utah, Vermont, and Washington – have VRU laws that define a set of road users as vulnerable and provide specific processes and penalties for actions directed at those users. Additionally, 17 states and the District of Columbia in some way address vulnerable road users by prohibiting certain actions — such as harassment or the throwing of objects — or by providing the ability for persons to be charged with greater penalties when their actions result in the injury or death of a vulnerable road user. The first state to pass a vulnerable road user law, which defined a set of road users as vulnerable and provided specific penalties for actions directed at those users, was Oregon, in 2007. Many of the other laws that protect vulnerable road users from certain actions were passed in response to tragedies caused by motorist-bicyclist collisions. As of the last revision to the Uniform Vehicle Code (UVC) in 2000, there is no UVC section equivalent to vulnerable road user laws. The closest relevant section is UVC 11-1111, which deals with glass and other substances likely to injure on a roadway. Some variation of UVC 11-1111 has been adopted in a majority of states. Oregon enacted the first Vulnerable Road User law in the U.S. in 2007. The law provides a definition of vulnerable users and sets out distinct penalties for the serious physical injury or death of vulnerable road users under the careless driving law. Careless driving is a Class A or B traffic violation — depending on whether it involves a crash — and requires a hearing when it involves the serious physical injury or death of a vulnerable road user. The penalties are significant when that careless driving results in a serious physical injury or death of a vulnerable road user: a fine that’s six times the standard maximum fine for a Class A traffic violation and a one-year suspension of driving privileges. In addition, Oregon addresses vehicular assault against bicyclists and pedestrians as a separate Class A misdemeanor. This vehicular assault law can complement or provide an alternative to a citation for a violation of Oregon’s safe passing law, giving law enforcement options to account for different driver behavior or enforcement concerns related to the safe passing law. Learn more about how the vulnerable road user law was developed and enacted here. Since the initial law, advocates, like the Bicycle Transportation Alliance, have worked for improvements, including an amendment in 2011. Bicyclists have been fighting for good roads and the right to use them since before the League of American Bicyclists was founded in 1880. Where to Ride laws strike at the very heart of advocacy: Bicyclists’ right to the road. When safety requires a bicyclist to take the lane, it is important that the law allows a bicyclist to do so. In this edition of Bike Law University, we take a look at Where to Ride laws and how they have shaped bicyclists safety. Where to Ride laws tell bicycles, or vehicles generally, how they should position themselves on the road. These laws create and manage the expectations of road users regarding the behavior of others while traveling on the road. In most states, the law that applies to bicyclists regarding road position starts with a variation of requiring a position as far to the right as practicable. When you talk about Where to Ride laws it is necessary to begin by defining the word practicable. In most states a bicyclist is required by law to ride as far to the right as practicable, sometimes referred to as AFRAP. The obvious and necessary question to a bicyclist seeking to comply with the law, motorists judging bicyclist behavior, and law enforcement officials tasked with enforcing the law is – what does practicable mean? So, inevitably a dictionary is consulted and we learn that it means “capable of being put into practice,” which is likely to mean one thing to an experienced road cyclist, one thing to a driver who is annoyed at a “law breaking” cyclist safely taking the lane, and a different thing to every law enforcement officer who by order or inclination enforces the law. What is practicable is often context sensitive based upon road and traffic conditions. The League generally recommends that cyclists ride in the right third of the lane with traffic. Delaware requires that cyclists "operate far enough to the right as judged safe" by the cyclist only in the special case when a right-hand travel lane is wide enough for a bicycle and a vehicle to travel safely side-by-side within the lane. These exceptions, along with the indefinite nature of what is “practicable”, can give cyclists substantial autonomy in deciding where they feel comfortable riding on a roadway given the conditions that exist on that roadway. Although these rules are usually phrased as exceptions, they can also be seen as clarifications regarding when it is practicable to ride to the right. It is important that cyclists are equipped with the legal rights to determine where they want to ride. When conflicts over shared road space arise between bicyclists and other road users or law enforcement it is important that safety is the primary concern rather than ideas about the hierarchy of road users and good Where to Ride laws allow the cyclist to decide what is safe. Rather than using the “as far to the right as practicable” language of most states, Colorado says that a bicyclists shall ride “far enough to the right as judged safe by the bicyclist to facilitate the movement of … overtaking vehicles.” Unlike the confusing term practicable, this language explicitly balances a cyclist’s need for safety with demands for efficient traffic flow. Cyclists are given further control over where they choose to ride because they are not expected or required to ride without a reasonable safety margin to the edge of the roadway. In addition, the law provides for all seven of the common exceptions to the “as far to the right as practicable” rule. The language of Colorado’s law is the result of Bicycle Colorado’s efforts after one police officer, acting upon his own unique interpretation of practicable, issued numerous tickets for failure to ride “as far to the right as practicable.” Bicycle Colorado attempted to educate the police officer regarding cycling safety and the reasons that his interpretation of practicable was detrimental to cyclist safety, but no common understanding was reached. By changing the law Bicycle Colorado was able to change this difficult to understand law to language that actually says something, and embodies the education message that would otherwise have to be done on a personal basis. Now cyclists, drivers, and law enforcement officers can simply look at the law, rather than having to resort to a dictionary and their own experiences to determine where a bicyclist can and should ride. 1) Bicyclist safety: Where to Ride laws are essential so that bicyclists are told to ride with traffic because they gain significant safety benefits when they do so. Bicyclists riding against traffic are more than 3 times more likely to be in an accident. To be safe a bicyclist needs room to maneuver in an emergency and the confidence to position him or herself appropriately given road and traffic conditions. The requirement to ride to the right does a great job of addressing that people ride with traffic. The seven common exceptions to this requirement provide a basis for bicyclists to position themselves so that they are visible to motor vehicle traffic, act like other vehicles, or otherwise protect themselves from turning vehicles and other hazards. 2) Bicyclists and traffic flow: Where to Ride laws address traffic flow by requiring bicycles to be operated on the far right side of the road, allowing motor vehicle traffic room to pass when a road is wide enough. Two of the common exceptions to the ride to the right requirement have a direct relationship to traffic flow. When a bicycle is operated at or above the speed of normal traffic flow there is no traffic flow or safety reason for a bicycle to be operated in a way other than a motor vehicle, and so in most states a bicycle is not required to ride to the far right in those circumstances. When a lane is not sufficiently wide for a bicycle and a vehicle to operate side by side there is a significant potential that riding to the far right may invite unsafe passing, and so in most states a bicycle is not required to ride to the far right in those circumstances. This exception correctly prioritizes bicyclist safety over fast traffic flow. It also appears to be one of the most commonly litigated exceptions as bicyclists taking the lane according to this exception are more likely to be in conflict with motor vehicle traffic flow for an extended period of time. Good Where to Ride laws manage the expectations of drivers and let drivers know that a bicyclist has the right to take the lane according to their personal judgment of their safety and road conditions. Bad Where to Ride laws prioritize motor vehicle traffic flow and limit the ability of a bicyclist to make judgments about their own personal safety. Additionally, bad laws may subject a bicyclist to prosecution and a fine for attempting to ride safely. It is important that our laws prioritize safety for all road users. Forty two states, and Washington, D.C., have a law that requires vehicles, or bicycles, to operate on the right side of the road and as near to the right side of the roadway as practicable if travelling at less than the prevailing speed of traffic. As previously discussed there are seven common exceptions to this requirement, and they occur in different frequencies. The average for all states is to have slightly more than four exceptions. The most common number of exceptions for a state to have is six. Helmet laws require any person on a bicycle wear a helmet. All current helmet laws are directed at persons under the age of 18. No state requires mandatory helmet use by all bicyclists. In many states, helmet laws can be enforced against the person on the bicycle or against a parent of that person. Some states with a mandatory helmet use law limit whether compliance with the law can be considered in civil lawsuits in order to prevent their laws from limiting the recovery of bicyclists who are injured. There are many other variations on the enforcement and effect of mandatory helmet use laws, as discussed through the laws of our spotlight states. The use of helmets is perhaps the most common recommendation for safer bicycling. The League has encouraged bicyclists to wear helmets for more than 25 years, and our affiliated clubs and advocacy groups typically require their use on organized rides. However, the League does not support mandatory helmet laws because of the many potential unintended consequences. The experience of countries with greater bicycle use than the United States tells us that safer bicycling comes from many policy decisions — especially safer infrastructure — and does not require mandatory helmet use laws. Mandatory helmet use laws may hurt bicyclist safety overall by discouraging bicycling, by promoting the idea that it is an unsafe activity or by raising a barrier to transportation choice — despite being the safest choice for an individual cyclist. We all want safer bicycling and policies that encourage more people to ride, provide appropriate facilities, and educate all road users about safely sharing the road. These are likely to be more effective in the long term. Twenty-one states and the District of Columbia have laws that require persons under the age of 18 to wear a helmet. Within that, however, the age threshold varies widely. Of states that require helmet use, most (12) only require helmets for persons less than 16 years of age.16 of the states that require helmet use, the District of Columbia and Virginia — which does not require helmet use but does enable local authorities to require helmet use — have a law that limits the consideration of the failure to wear a helmet in a lawsuit. This protects the ability of a bicyclist who chose not to wear a helmet to recover damages if they are injured in a crash. The need for and effect of such a law may be more or less necessary depending upon how liability or fault is determined in a state. The first state to pass a mandatory helmet law was California in 1986. The Consumer Product Safety Commission has had mandatory helmet performance requirements for helmet manufacturers since 1999. As of the last revision to the Uniform Vehicle Code (UVC) in 2000, there is no UVC section equivalent to a helmet law. When a community chooses to adopt a mandatory helmet use law there are many things to consider. The most common legal concept that varies between states is the age of the persons affected by the mandatory use law. The age standards of the states that have mandatory helmet use laws are detailed in the chart below. States have enacted laws that include some other legal concepts that I would like to highlight. No one state has a statute that includes all of the concepts that may be useful to consider when evaluating a mandatory helmet law, so here we’ll look at three. Limitation on Effect of Law – When you create a mandatory helmet use law you open up injured bicyclists to losing out on their ability to recover damages when they are injured if they were not wearing a helmet in compliance with the law. In certain situations, such as being hit by a speeding car, this could create inequity between injured bicyclists, or the families of deceased bicyclists, because of the law rather than the circumstances of the crash. By limiting the ability to consider compliance with a mandatory helmet use law ensures that the focus is on the circumstances of a crash rather than the compliance of the bicyclist with the law. Dismissal for hardship – In the United States data suggests that helmet ownership and usage is lower among low-income communities. Free or subsidized helmet programs have been shown to be an effective intervention to increase ownership and use within low-income communities. By providing for a waiver due economic hardship the law helps ensure that the impact of a mandatory helmet use law is not felt disproportionately by low-income communities or provide limit the ability of low-income individuals to take advantage of bicycling as a form of cheap transportation. Dismissal for purchase – The purpose of a mandatory helmet use law is to ensure that people have and use helmets while bicycling. By providing a waiver of a fine for a violation of a mandatory helmet use law if a bicyclist can show the purchase of a helmet a bicyclist is given an incentive to ensure they can comply with the law in the future. Religious exception – Some religions have beliefs that are inconsistent with properly wearing a bicycle helmet. For instance, devout Sikhs are expected to wear a turban which a bicycle helmet cannot accommodate. By providing a religious exception to the application of a mandatory helmet use law these religious communities are not disproportionately affected by the law and continue to use and enjoy bicycles. “Dooring” collisions are likely one of the more common bicyclist-vehicle collision types, particularly in urban areas. Between 2010 and 2012, data from the City of Chicago showed dooring crashes making up between 7.3 and 19.7% of reported bicycle crashes. The Boston Cyclist Safety Report published in 2013 found that dooring crashes made up between 7 and 13% of all bicycle collisions in Boston between 2009 and 2012. Naturalistic studies, which rely on audio, video, and telemetric data recorded about a bicyclist’s journey, point toward dooring threats being common as anAustralian study found that unexpectedly opened vehicle doors accounted for 17.6% of bicyclist driver interactions. Forty one states have a dooring law. The nine states without a dooring law are: Connecticut, Indiana, Iowa, Kentucky, Michigan, New Jersey, North Carolina, Tennessee, and West Virginia. In thirty-eight states the dooring law applies to people leaving their door open longer than necessary to load or unload a passenger or cargo, as well as when a door is opened without caution. Bicycles on sidewalks have long been debated: Is it legal? Is it safer? Shouldn’t children be able to ride there? In this edition of Bike Law University, we take a look at sidewalk riding, which is a perfect microcosm of the complicated relationship between bicycles and traffic laws in most states. Sidewalk riding laws define the rights and duties of a bicyclist when riding on a sidewalk. Whether a bicycle can be legally ridden on a sidewalk highlights the complicated and hybrid nature of the bicycle under current traffic laws in most states. A bicycle is at once a vehicle, given all the rights and duties of a vehicle; its own entity, subject to specifically tailored alternative rules; and in some cases treated as a pedestrian, with all accompanying rights and duties. In some instances, laws related to sidewalk riding can also highlight a division between adult and child bicycling. In addition to these issues caused by the hybrid nature of bicycles, many states leave their traffic laws open to change by localities, either in limited circumstances or through a general grant of power. Whether a bicycle may be ridden on a sidewalk is often explicitly allowed to be a local decision and may also be limited in central business districts, where pedestrian traffic is likely to be heavier. The League recommends that bicyclists ride on the road. Riding on the sidewalk is a significant cause of bicyclist-motorist crashes and creates unnecessary conflicts with pedestrians. There are many reasons that bicyclists belong in the road rather than upon the sidewalk, including obstructions, unpredictable pedestrian movements, limited visibility, and the limited design speed of sidewalks. However, there may be appropriate times to ride on a sidewalk or crosswalk, such as when crossing an unsafe high speed roadway or when the skill or ability level of the rider is not suited for the adjacent roadway, as can be the case with children. When a bicyclist chooses to ride on sidewalks or crosswalks, sidewalk riding laws can clarify expectations for pedestrians, motorists, and bicyclists regarding how each mode will interact. When states fail to make the rights and duties of users of different modes clear in these hybrid situations they make it more difficult for public education efforts to be authoritative, create confusion regarding who is “right,” and may unintentionally limit the ability of crash victims to recover. It is possible that this lack of clarity may be a sign that these hybrid situations are thought more suitable for court decision-making rather than legislative decision-making because of the individualized and context-sensitive nature of these mode interactions. Even in states where there are “good” laws that make the rules for each road or sidewalk user clear the best answer to these context-sensitive situations is to create a better context. Dedicated bicycle infrastructure is a demonstrated way to reduce sidewalk riding by bicyclists and an appropriate response. 7 states prohibit bicycles on sidewalks because bicycles are vehicles, and vehicles are prohibited on sidewalks. In 10 states it is unclear whether bicycles are prohibited from sidewalks because they are not defined as vehicles, but a bicyclist has all of the rights and all of the duties applicable to the driver of any vehicle except as to those provisions which by their nature can have no application, and vehicles are prohibited on sidewalks. In 8 states no law was found regulating the use of sidewalks by either bicycles or vehicles. 22 states require a bicyclist to yield to a pedestrian while riding on a sidewalk. 18 states require a bicyclist to give an audible signal before passing a pedestrian while riding on a sidewalk. 5 states limit the speed of at which a bicycle can be ridden on a sidewalk. 14 states say that a bicyclist riding on a sidewalk has all the rights and duties of a pedestrian in the same circumstances. In all but one of these states there is a variation of the requirement that pedestrians cannot suddenly leave a curb into the path of a vehicle that is so close as to constitute an immediate hazard. A bicyclist must give an audible signal before passing a pedestrian. Bicycles must be operated at a reasonable and prudent speed. Upon the shared space of a sidewalk, path, trail, or crosswalk a bicyclist is most likely to be the largest, fastest moving user of that shared space, with the most potential to injure another user of that space. The exceptions that are found in Utah’s law reflect the idea that a more dangerous user of a shared space should be subject to rules that account for that danger. Several states make a distinction between bicycles and motorized bicycles to further account for the real or perceived danger of heavier, faster, moving users on a sidewalk and prohibit motorized bicycles. Whether these additional rules are necessary or desirable can be debated, but they provide some parallels for discussions of appropriate rules for shared roadways. Ohio also has a statute provision worth mentioning: In the Buckeye State, bicycles can be prohibited from sidewalks by sign or ordinance, but cannot be required to ride upon the sidewalk by sign or ordinance. This ensures that bicyclists can always use the road, and is an at this time unique provision to bolster the vehicle portion of the hybrid rights and duties of bicycles. Mandatory Use laws require bicyclists to use facilities that are provided or designated for their use. These laws generally require a bicyclist to use a separated path (often referred to as a sidepath), a marked bike lane, or a roadway shoulder, rather than the parallel or adjacent travel lanes provided for motor vehicles. Some, but not all, of these laws provide a standard for the facility, allowing a bicyclist some flexibility to choose to use the roadway rather than the facility if that standard is not met. In the 1970s, mandatory use laws of some sort existed in 38 states. Since that time many cycling advocates and state legislatures have worked together to repeal many of those laws. Today there are 17 states with some type of mandatory use law and only 11 of those states have laws that apply in most circumstances. The League believes that cyclists have a fundamental right to the road. For a great discussion of the emergence of cyclists’ right to the road and its current foundation I recommend reading the first chapter of Bob Mionske’s Bicycling and the Law. The League does not support mandatory use laws, and believes that cyclists should not be required to use dedicated bicycle facilities. The League believes that cyclists have a fundamental right to the road. Laws that mandate that a bicyclist use a particular facility undermine the ability of a bicyclist to protect him or herself when those facilities are not well planned, designed, and/or maintained. They may also promote unhealthy relationships between bicyclists, other road users, and law enforcement by setting authoritative rules where education and judgment might be more effective. There are numerous operational reasons why a dedicated bike facility might be rendered unsafe or impractical -- such as an accumulation of debris, illegally parked vehicles, the need to make a left turn -- and in such cases cyclists need to be able to ride in the adjacent or parellel travel lanes without fear of prosecution. In addition, it is difficult to design a bike lane or path that will appropriately accommodate the great diversity of bicyclists from children to professional racers and mandatory use laws fail to recognize the different needs of the many members of the cycling community. The best way for communities to encourage bike lane and path use is to build them and build them well. There is tremendous demand and use of bike lanes and paths regardless of mandates. Building facilities that at least meet the standards developed by the National Association of City Transportation Officials (NACTO) or American Association of State Highway Transportation Officials (AASHTO) is a great way to ensure that those facilities are well built and will provide cyclists with safety and comfort. When safe, comfortable, and accessible facilities are built then most cyclists will choose to use them. Although great progress has been made since the 1970s, mandatory use laws are still a problem, showing up in federal and state contexts. The League believes that these laws do nothing to benefit bicyclists and should be fought at every level. Click here for the full chart. In Georgia and Utah the laws merely enable localities to enact mandatory use laws. In Connecticut the law only require the mandatory use of a separated facility when such a facility is marked on a highway or parkway (i.e. limited access roadways). In Kansas the law only applies when a sidepath is dedicated to bike use only. In Oklahoma the law only requires the use of a bike path within parks. After accounting for these six states that have mandatory use laws of limited applicability there are only 10 states with mandatory use laws that generally apply. Several of these states provide exceptions to their mandatory use laws to address the many situations in which strict application of the law would be unsafe or impractical. There are five common exceptions and they occur in different frequencies. The average for all states is 2.5 exceptions. The most common number of exceptions for a state to have is zero. If you are a fan of bicycle lanes and paths, then you probably like Oregon. Since the 1971 “Bike Bill”, bicycle facilities have been required whenever a road, street or highway is built or rebuilt. Unfortunately, Oregon requires the use of a bicycle lane or path when one is available. While Oregon would be even better for bicycling if it had no mandatory use law, there are some notable features of Oregon’s mandatory use law which are an improvement upon more common mandatory use laws. A relatively strong standard for the quality of bike facilities: Oregon’s mandatory use law requires that a bicycle path or lane be “suitable for safe bicycle use at reasonable rates of speed.” This standard does not adopt a specific national facility standard, like those created by the National Association of City Transportation Officials (NACTO) or American Association of State Highway Transportation Officials (AASHTO). Newer standards, especially those put forward by NACTO do a very good job of making it likely bike lanes built to that standard are “suitable for safe bicycle use at reasonable rates of speed.” While standards are a great start they may not encompass all factors that are important to local cycling communities and an open standard allows other evidence regarding the suitability of the path or lane to be considered. A public process for review of bike facilities: Oregon’s mandatory use law requires a “public hearing” regarding whether bicycle facilities meet the standard of “suitable for safe bicycle use at reasonable rates of speed” before a citizen can be cited for violation of the law. The extent of the public hearing is not defined. Portland has argued that the public hearing process regarding its Bicycle Master Plan is sufficient. Other localities have used City Council hearings. Several exceptions to the requirement of mandatory use: Oregon’s mandatory use law has five exceptions that mirror the exceptions seen in many far to the right laws. One exception worth particular note is that a bicyclist can move out of a bicycle lane or path if they are continuing straight through an intersection and the lane or path is to the right of a lane from which a motor vehicle must turn right, allowing cyclists to prevent right hook collisions. It is also worth mentioning that in some states local jurisdictions may enact mandatory use laws. Iowa’s State Attorney General recently issued an opinion that local mandatory use laws conflict with Iowa’s state traffic law. If your state has not issued an opinion on the subject it may be worthwhile to look at that opinion and see if similar reasoning may apply in your state to preclude local mandatory use laws. In 1944 §11-1205(c) was added to the Uniform Vehicle Code (UVC) and contained a mandatory sidepath provision. By 1979, only 12 states did not have a law similar to the mandatory sidepath provision set out in §11-1205(c). In 1979, §11-1205(c) was eliminated from the UVC and now only 17 states retain some version of a mandatory use law. As of the last revision to the UVC in 2000, there is no UVC sections equivalent to either a mandatory bike path or bike lane use law. Generally, distracted driving can be caused by any activity that can divert a person’s attention away from the primary task of driving. Although distracted driving can take many forms, distracted driving laws are primarily a response to the spread of mobile communications devices into our vehicles. The most common distracted driving laws include bans on text messaging, bans on cell-phone use, and the required use of a hands-free device while operating a mobile communications device in a vehicle. These laws can either be primary enforcement laws, which means a driver can be pulled over solely for violating the distracted driving law, or secondary enforcement laws, which means that the distracted driving law can only be enforced if another traffic offense also takes place. In 2015, 3,477 people were killed and 391,000 were injured in motor vehicle crashes involving distracted drivers. The prevalence and use of mobile communications devices has increased dramatically in the last decade and is likely to continue to increase. Some polls suggest that 37% or more of drivers text while driving. Safe bicycling and safe driving requires an awareness of your surroundings that is made more difficult by the use of mobile communications devices in vehicles. Distracted driving laws are important because they encourage people to stay focused on the task of driving and can be used in legal actions resulting from collisions or other incidents between road users. April is National Distracted Driving Awareness Month and there are numerous national, state, and local campaigns to educate the public about the dangers of not putting down your cell phone behind the wheel. While there is widespread understanding that distracted driving is bad (a recent AAA survey found that over 80% of people find texting or emailing while driving a serious threat to safety), many people still engage in those behaviors (the same survey found that over 40% of drivers had read an email or text within the last 30 days) and some states still lack laws that make it illegal to text while driving. Sharing the road is much harder when people are not looking at the road. Effective distracted driving laws and enforcement are key to discouraging this dangerous behavior. If you would like to know more about the dangers of distracted driving, particularly distracted driving caused by the use of mobile communications devices, the National Highway Traffic Safety Administration (NHTSA) and the US Department of Transportation (DOT) have a great site with links to research and reports on the issue. For some information about how MAP-21 provides incentive grants for distracted driving programs please see this report put together by the Advocates for Highway and Auto Safety or this press release from NHTSA. Thirty-nine states ban text messaging for all drivers, and 33 states ban all cell phone use by novice drivers. Ten states prohibit all drivers from using handheld cell phones while driving. To learn more about the various laws targeting distracted driving please see the excellent information put together by the Governors Highway Safety Association. New Jersey has some of the strongest laws in the country to combat distracted driving. It is one of only two states — the other is Delaware — that has primary enforcement laws against all cell phone use by school bus and novice drivers, text messaging by all drivers, handheld use by all drivers, and includes a category for cell phone/electronic equipment distraction on police accident forms, according to the Governors Highway Safety Association. Every year since 2008 New Jersey drivers have been issued about 100,000 summons based upon illegal talking or texting while driving. Recent studies have shown that strong texting bans can reduce fatal single-occupancy, single-vehicle crashes but that vigilant enforcement is needed and concurrent handheld bans increase the effectiveness of texting bans. As of the last revision to the Uniform Vehicle Code (UVC) in 2000, there are no UVC sections relevant to distracted driving. For an excellent explanation of the “Idaho stop” please watch this video by Spencer Boomhower: http://vimeo.com/4140910#at=0. Red light exceptions take several forms and may also be referred to as “dead red” laws. Most of these laws are a reaction to the inability of traffic lights to detect small vehicles, such as motorcycles and bicycles. These laws allow certain vehicles to proceed through a red light after stopping for a specified amount of time. The major features of these laws that vary by state are: 1) the conditions under which a vehicle can proceed through the intersection, 2) the nature of the light that can ignored, and 3) whether there are additional qualifications for the exception. The “Idaho stop” gets a lot of strong reactions within the bicycling community. “Dead red” laws get less press. However, both fit together because they are, at least in part, reactions to the difficulties of being a cyclist in a traffic system that was not designed for cyclists. You should care about these laws because they make cycling easier and, based on the available evidence, make it safer. In a world where governments are making great strides to promote cycling as a solution to health and environmental problems, and as a key to economic development, laws that make cycling easier without having a quantifiable downside should be an easy sell. One problem with the “Idaho stop” is that it undermines an idea that has great mindshare in the cycling community – same road, same rules. The “Idaho stop” is clearly a case of same road, different rules. Earlier this year an opinion piece on the BBC offered that motorists hate cyclists “when they use the roads but don't follow the same rules as cars.” The relationship between motorists and cyclists is likely not that simple, but the historical commitment of both cyclists and motorists to this idea contributes to making the “Idaho stop” politically perilous for cycling advocates and makes it difficult to discuss the merits of traffic behaviors that cyclists do, but motorists cannot do. The League supports the development of traffic laws that ensure the fair and consistent treatment of cyclists. We do not currently have a position on “Idaho stop” and “dead red” laws. Our core principles include following the rules of the road including all traffic signs, signals, and markings. “Idaho stop” and “dead red” laws may have many positive benefits and have not been shown to be dangerous, but are currently not widespread. 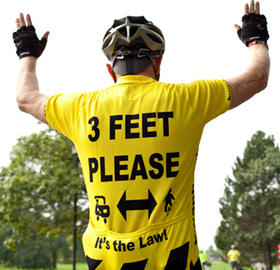 Responsible cyclists should follow the rules of their state and local jurisdictions. Many of the inconveniences of unwarranted stop signs and traffic lights that do not detect bicyclists can be mitigated or solved by engineering solutions, such as the creation of bicycle boulevards and better adjusted signals. Idaho is the only state that has both a stop as yield rule and a red light exception that allows a cyclist to proceed through a red light after yielding - the "Idaho Stop." Delaware has a stop as yield rule - the "Delaware Yield" - but not a red light as stop sign rule as in Idaho. Arizona, Illinois, Kansas, Minnesota, Missouri, Nevada, Oregon, Tennessee, Washington, and Wisconsin allow a cyclist to proceed through an inoperative and/or malfunctioning light after either a specified period of time or a reasonable period of time. Indiana, South Carolina, Utah, Virginia, and Wisconsin allow a cyclist to proceed through a red light after either a specified period of time or a reasonable period of time. Oregon, Tennessee, Washington and Wisconsin qualify their laws in unique ways. Oregon, Tennessee, and Washington requires that the intersection actually be controlled by a vehicle detection device. Wisconsin requires that the bicyclist have a reasonable belief that the intersection is controlled by a vehicle detection device. Under either law, a cyclist should take extra care to ensure that they can proceed through the intersection and should familiarize themselves with common vehicle detection devices. Washington State also has a law that requires signals to be adjusted to routinely and reliably detect bicycles. There is no Uniform Vehicle Code (UVC) provision equivalent to an “Idaho stop” or “Dead red” law. Obedience to traffic lights is generally dealt with in UVC §11-202 and obedience to stop and yield signs is dealt with in UVC §11-403. The authorization of local regulations of bicycles is addressed in the UVC in section 15-102(a)(8). An excellent history of the Idaho law is available here. The “Idaho stop” law is really comprised of two rules that modify how bicyclists treat traffic control devices that control intersections. The first rule is the real “Idaho stop” in that it modifies how bicyclists treat stop signs. Although several localities have adopted similar rules, it is singularly unique as a state law. 1. Slow down, and if required for safety, stop. 2. Yield the right-of-way to any vehicle in the intersection or approaching, if the approaching vehicle will create a hazard while they cross the intersection. 3. Proceed after appropriately slowing and yielding without stopping. The second rule is a very permissive red light exception. While all other red light exceptions contain language that indicates that proceeding against a red light is only appropriate when the signal fails to detect a bicyclist the exception in Idaho contains no such language. As with the “Idaho stop” the reason for the law is encouraging cycling by making it easier. 2. Yield to all other traffic. 3. Proceed through the red light with caution. In addition, a bicyclist can proceed through a red light after yielding, without stopping, if making a right turn. Since the law was adopted in 1982 the only change has been a clarification of the red light exception. That change clarified that a cyclist must come to a stop when making a left turn onto a one-way highway, rather than in the same manner as when making a right turn. Share the Road license plates are specialty plates for cars that show support for the bicycling community. Specialty license plates are usually created after a legislative or administrative process that involves a certain amount of guaranteed sales. Plates can usually be bought at any time and often provide dedicated funding for an advocacy organization in a state. In many states, funds gained through Share the Road license plates are set aside for bicycle safety or education programs, or are shared with bicycle advocacy organizations in the state. In this way, Share the Road plates can be an important tool to ensure that there is dedicated funding for bicycling advocacy organizations or programs in addition to spreading the valuable message to “share the road.” Specialty plates can also be a form of outreach for bicycling advocacy organizations because they are purchased through the state Department of Motor Vehicles or equivalent agency and may expose [unfinished sentence]. Twenty six states have some version of a “Share the Road” plate. In 17 of those states, a bicycling advocacy organization is identified in the law or otherwise to receive funds from the program. In two states, Connecticut and West Virginia, a law is on the books but there is currently no way to purchase the specialty plates. The first state to issue a Share the Road plate was Florida in 1999. For more information on how Share the Road plates began please visit this website: http://sharetheroad.org/the-story/. As of the last revision to the Uniform Vehicle Code (UVC) in 2000, there is no UVC section relevant to the creation and operation of a share the road license plate program. Mississippi is one of 11 states that designate a bicycling advocacy organization as the recipient of funds produced from the sale of “share the road” specialty license plates. The Mississippi law also gives its chosen bicycling advocacy organization, the Bicycling Advocacy Group of Mississippi, better known as Bike Walk Mississippi, an advisory role in the design of the plates. In Iowa, an organization can get a specialty license plate through either a law or administrative process. The Iowa Department of Transportation (DOT) sponsored the Iowa Bicycle Coalition to create a specialty plate administratively. The Iowa Bicycle Coalition had complete control over the design of the plates, but had to pre-sell 500 plates in order to complete the administrative process. There are now more than 1,300 Share the Road plates on the road and it is the second highest selling specialty plate in the state. Questions? Contact me at ken@bikeleague.org. Bicycling under the influence laws are very rare, often times leaving a gray area in the law. In this edition of Bike Law University, we take a look at BUI laws and how they're implemented across the country. BUI laws provide specific penalties for bicyclists that are found to be riding while under the influence of drugs or alcohol. In most cases, BUI laws differ from Driving Under the Influence (DUI) laws by providing for less severe penalties and by not affecting a person’s driver’s license. 1. Is there a bicycle-specific DUI-like statute? When there is a BUI statute that law will likely govern how intoxicated cyclists are treated, unless law enforcement officers choose to use more general public intoxication laws or the statute does not clearly prevent the DUI law from applying. 2. Is a bicycle a vehicle? Although bicycles are always given the rights and duties of vehicles, they are not always actually defined as vehicles. It is important to look at the vehicle definition in the state code in addition to the definition of bicycle. 3. Is the DUI statute written for all vehicles? Because the definition for vehicle is often very broad, DUI statutes are sometimes written for motor vehicles, rather than vehicles generally. In some states, the DUI law will alternatively specifically exclude vehicles moved solely by human power or provide for some other altered definition that more specifically targets motor vehicles. 4. Is there case law on the subject in this state? In my search of Google Scholar I found 18 states that have case law on the applicability of their DUI law to the bicyclists. The case law generally centers on two areas of interest: 1) whether bicyclists are by their nature exempt from all or part of the DUI law, and 2) whether the statutory language and intent precludes the application of the DUI law to bicyclists. 5. What is the most likely outcome of litigation on this subject if the law is not clear?In states that do not have case law on the subject, or where the only decisions are by lower level courts and are not definitive, I looked at the trends in interpretation by courts in other states. These trends of interpretation will be discussed below. There are several studies that support the idea that BUI is a safety problem, and specifically that “[a]lcohol-intoxicated riders are considerably more likely than sober cyclists to be severely injured or killed.” According to Peter Jacobsen and Harry Rutter in City Cycling, “[i]n one study in Portland, Oregon, although only 15 percent of killed and hospitalized adult cyclists had elevated blood alcohol levels, half of the adult cyclists with fatal injuries were intoxicated (Frank et al. 1995).” In another study: “Of 200 injured cyclists reviewed during a study at a regional trauma center in Austin, Texas, 40 either had measurably elevated blood alcohol levels or themselves reported having consumed alcohol. The intoxicated cyclists were much more likely to have been injured at night or in the rain and to have been admitted to the hospital. Only 1 of the 40 (2.5%) alcohol-consuming cyclists had worn a helmet, compared to 44 percent of the others. Both cyclists who incurred severe brain injuries were intoxicated, and the average hospital care cost of the alcohol-consuming cyclists was twice that of their sober counterparts. (Crocker et al. 2010).” Beyond the dangers caused by alcohol intoxication, it seems likely that intoxication is associated with behaviors that otherwise increase the risks of injury while bicycling such as riding without a helmet, riding at night, and riding without proper reflective gear or lights. That intoxicated cyclists are overrepresented amongst cycling fatalities should not be confused with the idea that BUI is a widespread problem within the bicycling community or that its reduction will dramatically improve roadway safety. Although, the mixing of bicycling culture and beer culture can be seen in many examples, from breweries organizing bike-themed festivals to bicycle concepts built around transporting beer, and, in some cases, bicycles are the transportation choice of persons who have lost their driver’s licenses due to DUI, there is little evidence to suggest that BUI is common. The evidence that does exist suggests that BUI is less common than other forms of intoxicated transportation. Doing a better job of recognizing and dealing with BUI can be part of a road safety agenda, but our current legal system does not seem to be equipped to deal with the issue. To be taken seriously as road users, with the same rights and responsibilities as the operators of motor vehicles, means that cyclists should avoid BUI. However, the potential harm of BUI is not readily comparable to the well documented dangers of DUI. The normalization of bicycles as a legitimate transportation mode does not mean that bicyclists should be fit into the pre-existing framework for motor vehicles, but that they should be treated with the same seriousness. BUI and DUI are separate public policy issues that deserve separate public policy responses. Four states have BUI statutes that provide specific penalties for bicyclists found riding under the influence. In five states a statute exempts bicyclists from all or part of the state DUI statute. In the remaining 41 states the application of the state’s DUI laws may be unclear, unless controlling case law exists.In 24 other states, there is some reason to believe, based upon the language of the DUI statute, definition of a vehicle, or the interaction of the two, that the DUI law does not apply to bicyclists. In these states a bicyclist may still get in serious trouble for BUI, but it is likely that a bicyclist will be cited with another statute, such as disorderly conduct or drunk in public. In the remaining 21 states, and the District of Columbia, it is likely that bicyclists can be charged with DUI based upon the reasoning laid out previously in this post. Driving under the influence is addressed in the Uniform Vehicle Code (UVC) in §11-902. There is no Bicycling under the influence equivalent, however applying the reasoning discussed previously to the UVC (esp. §§1-215, 1-109, 11-1202, and 11-902), bicyclists would likely be subject to the UVC’s DUI provisions. In Washington, a bicycle is defined as a vehicle and the DUI law applies to all vehicles. In most states with similar language courts have found the DUI law to apply to bicycles. However, in 1995, the Division 2 Court of Appeals of Washington in Montesano v. Wells, 902 P.2d 1266 (1995), held that Washington State’s DUI law was meant to apply only to motor vehicles. Since this decision Washington State passed new legislation on the subject of bicycling under the influence (BUI). This new legislation deals with the safety issues that BUI can cause for cyclists, but minimizes the punishment for BUI. (b) Release the intoxicated bicycle rider to a competent person. (2) The law enforcement officer shall not provide the assistance offered if the bicycle rider refuses to accept it. No suit or action may be commenced or prosecuted against the law enforcement officer, law enforcement agency, the state of Washington, or any political subdivision of the state for any act resulting from the refusal of the bicycle rider to accept this assistance. This law does not give cyclists a free pass, or turn the police into their taxi service, but rather provides for a way to get intoxicated cyclists and pedestrians away from streets where they may be in danger without invoking harsh penalties meant for intoxicated drivers or more general laws related to the disruption that may be caused by an intoxicated person in public. What the law does is recognize that intoxicated cyclists, and pedestrians, are likely to primarily endanger themselves and that there is a public interest in protecting them. Where bicycles are vehicles, and the DUI statute is written for all vehicles, courts overwhelmingly find that the DUI statute applies to bicycles. This has been found in the District of Columbia [Everton v. DC, 993 A.2d 595 at 596-7 (2010)], Florida [State v. Howard, 510 So.2d 612 (1987)], North Dakota [Lincoln v. Johnston, 2012 ND 139 (2012)], Ohio [Ohio v. Hilderbrand, 40 Ohio App. 3d 42 (1987)], Oregon [State v. Woodruff, 726 P.2d 396 (1986)], Pennsylvania [Commonwealth v. Sheriff, 7 Pa. D. & C. 4th 201 (1990); Commonwealth v. Brown, 423 Pa. Superior Ct. 264 (1993)], and South Dakota [State v. Bordeaux, 710 N.W. 2d 169 (2006), the law has since been amended]. In each case, although the number and complexity of the statutes involve varies, the plain language of the statutes meant that bicycles were vehicles and the DUI law applied to all vehicles. However, in Washington [Montesano v. Wells, 902 P.2d 1266 (1995)], the court found that although “a literal reading … appears to allow the state to charge bicyclists with driving under the influence” the legislature did not intend such application. The court reached this finding because the definition of vehicle was only recently amended to include bicycles, and the DUI statute was not amended to address this new definition. The court found it particularly persuasive that the DUI statute used vehicle and motor vehicle interchangeably in a way that would have made bicyclists subject to DUI but not subject to a lesser included offense, and that such application would be absurd. Additionally, public policy considerations that informed the DUI law, the extreme danger inherent in motor vehicles, did not weigh in favor of applying the DUI law to bicycles. 2.Where bicycles are vehicles, and the DUI statute is written for anything other than all vehicles, it is less clear that a court will apply the DUI statute to bicycles. In Louisiana [State v. Carr, 761 So.2d 1271 (2000)], the Louisiana Supreme Court found that there was an ambiguity in the larger statute of which their DUI was part that suggested two reasonable interpretations where “other means of conveyance” could mean motorized or non-motorized conveyances. Due to this ambiguity, the principle of lenity – that ambiguous criminal statutes should be strictly construed in favor of the defendant to ensure that they provide fair warning of what is criminal, led the court to conclude that a bicycle was not an “other means of conveyance. This has been the case in California [Clingenpeel v. Municipal Court, 108 Cal.App.3d 394 (1980)], Illinois [People v. Schaefer, 654 N.E.2d 267 (1995)], Kansas [City of Wichita v. Hackett, 275 Kan. 848 (2003)], and Michigan [Hullett v. Smiedendorf, 52 F. Supp. 2d 817 (1999)]. The State argues that their statute based on UVC 11-1202 [“Every person propelling a vehicle by human power or riding a bicycle shall have all of the rights and all of the duties applicable to the driver of any other vehicle under chapters 10 [accidents and accident reporting] and 11 [rules of the road], except as to special regulations in this article and except as to those provisions which by their nature can have no application.”], persons on bicycles are subject to the DUI law because they are subject to all of the duties applicable to the driver of a vehicle. The Court finds ambiguity in the statute based on UVC 11-1202 because it would be reasonable to interpret that either: 1.Bicycles are not vehicles – and the plain language of the DUI laws only applies to vehicles – therefore the state’s DUI laws by their nature do not apply to bicycles. 2.The state’s version of UVC 11-1202 subjects bicyclists to the same duties applicable to drivers of vehicles – and therefore bicyclists should be subject to the DUI laws. The Court finds that the ambiguity makes it so that the laws do not inform cyclists that they are liable to punishment for driving a bicycle while under the influence in terms sufficiently clear that men of common intelligence would not differ as to its application, and therefore the laws do not subject bicyclists to criminal sanctions. The Court may supplement its textual reasoning with public policy arguments based upon the smaller threat to the public due to intoxicated bicyclists, as when the Court in Clingenpeel said “[p]eople of common intelligence would not assume that [DUI punishment] was intended to be made applicable to drunk driving of bicycles, to which it would appear to be an overkill” because “the combination of bicycle and cyclist does not possess the "great force and speed nor is it capable of producing the carnage and slaughter reaching the astounding figures only heard of on the battlefield (citations omitted)." This has been the case in DUI cases in New Jersey [State v. Machuzak, 227 N.J. Super. 279 (1988); State v. Johnson, 203 N.J. Super. 436 (1985)] and by analogy in New York [People v. Szymanski, 63 Misc.2d 40 (1970)]. In addition, in Oregon [State v. Woodruff, 726 P.2d 396 (1986)] and Pennsylvania [Commonwealth v. Sheriff, 7 Pa. D. & C. 4th 201 (1990)] found that implied consent laws did not apply because those laws used “motor vehicle” rather than “vehicle.” In these cases, the courts generally find that the plain language of the statutes mean that they do not apply to bicyclists or other persons who do not fall within the definition of “motor vehicle.” Because the legislature chose to categorize vehicles differently (motor vehicles vs. other vehicles), the courts commonly say that it is the responsibility of the legislature to resolve the ambiguity of the DUI laws application to bicyclists. In New York, the Szymanski case dealt with a horse-drawn carriage but the court noted that identical language dealt with persons riding bicycles and the same logic applied. However, there is a split amongst New Jersey trial courts and State v. Tehan, 190 N.J. Super. 348 (1982) found that the state’s DUI law could be applied to bicyclists, but the bicyclist could not have their license suspended even though the DUI law did apply. This decision is criticized in the later cases from New Jersey as giving greater effect to the statute than the statute’s language requires and ignoring the DUI law’s more specific language when applying the language that gives a person on a bicycle the duties of the driver of a vehicle. Since all three cases are the decisions of trial courts, none of the cases are determinative of how the DUI law will be applied in New Jersey. 5.Courts do not generally find that DUI laws are the type of duty that by its nature cannot apply to a person riding a bicycle. While there are instances of bicyclists being held exempt from rules of the road due to the different natures of bicycles and other vehicles (according to a New York State Appellate Court, Secor v. Kohl, 67 A.D.2d 358 at 362-3 (1979), bicyclists are exempt from signaling continuously for the same number of feet as a car, because that requirement was based upon the speed at which a car travels), courts generally rely upon the plain language of the statutes or overall the intent of the legislative scheme rather than looking at the nature of bicycles and other vehicles and the public policy reasons for prohibiting the intoxicated operation of different vehicle types. An exception is the New Jersey case, Tehan, where the court found that because bicycling is an unlicensed activity the license forfeiture provisions of the DUI law could not require that defendant forfeit his right to operate his bicycle on the roads. The discussion above hopefully helps you to understand whether or not your state has confronted the issue and whether it has done so in an appropriate manner. As bicycling becomes more popular instances of BUI are likely to increase and there is likely to be renewed interest in enforcing DUI laws against bicyclists. The bicycling community should be ready to talk about the real safety issues caused by BUI, but it is entirely appropriate to consider, as many courts already have, the vast difference in the threat to public safety caused by intoxicated bicyclist vs. intoxicated motor vehicle drivers. Our understanding of the danger that it poses, both to bicyclists and to the public generally, is limited because of the general lack of bicycle accident data but it is hard to believe that it approaches the severity of DUI. As others have argued, I think that BUI should be recognized as a distinct public policy issue that deserves its own solution, rather than shoehorned into our DUI laws. Rarely, a person riding may notice that they pass from one jurisdiction to another. Maybe there is a Bicycle Friendly Community sign celebrating that jurisdiction’s efforts to improve bicycling conditions, maybe there is a general purpose sign saying that you have entered or are leaving the great city of Wherever. Perhaps, but hopefully not too frequently, the change from one jurisdiction to another will be met with an ominous sign that affects your rights as a bicyclist. The most common may be “No bicycling on sidewalks in the Central Business District,” but depending upon the powers of a local government there may be few, if any, limits on what restrictions you may face. In this edition of Bike Law University, I'm digging into the authorization of local regulations as they relate to riding a bike from one community to the next -- and how that might affect your ride. The United States is a land of experimentation and local decision making, a product of our belief that local decisions are often the best decisions. A long ride might take you through several jurisdictions with several, possibly conflicting, rules. State laws related to local regulations may either give power or limit power depending upon the relationship between the state and local jurisdictions. Where there is a state law that specifically provides a rule it is both a grant and a limitation. Localities may create their own rules that are in accordance with the grant, but are generally limited because they cannot conflict with the state law. Local bicycle regulations often show up in larger stories about bicycle regulations. In some cases this is due to local reaction to new technology –- such as New York City banning e-bikes. In others, it can be due to the selective enforcement of little known local laws -– such as alleged racial discrimination in how a Fort Lauderdale bicycle registration ordinance was enforced. In most cases, local ordinances negatively impact bicyclists by adding restrictions or fees not present in state laws. As a cyclist you should care about the relationship between state and local governments because it may allow the rules of the road to be different for different portions of your ride. It may also serve to limit or empower your local jurisdiction when you advocate for better biking policies or seek to have a restriction removed. In general, the language of this type of statutes in many states reflects older language that was proposed at the national level decades ago and does not necessarily reflect modern attitudes about how bicyclists should be treated. While local decision making can result in many positive things, bicyclists would most likely be better served by uniform rules of the road. View the full chart by clicking here. WHAT ARE LOCAL REGULATION LAWS? A list of powers allowed under the grant– parking regulations, operation regulations, registration, and inspection. In a few states there may also be limitations, such as the five states that explicitly state that local regulations cannot conflict with state traffic laws, or Ohio, which prevents localities from limiting the use of some roadways and requiring the use of sidewalks. In addition to the laws that specifically authorize the local regulation of bicycles, there are at least three concepts you should be familiar with before looking at your state’s law related to local regulations affecting bicycling. The first is home rule, the second is general law, and the third is Dillon’s rule. All of these concepts can exist within the same state. In general these three concepts govern the relationship between the state and local government, giving local governments certain powers to create rules or restricting those powers. These relationships can be complicated and this article will not attempt to explain them here. If you are interested in state-local government relationships you can find out morehere. Thirty four states have a law that allows local jurisdictions to regulate bicycles, or bicyclists, in some way. 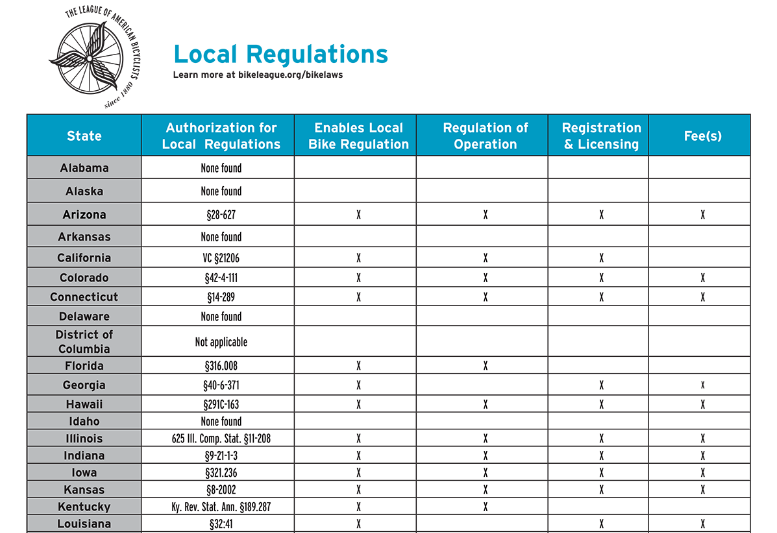 The most common authorization of local regulations allows local authorities to regulate the operation of bicyclists, with thirty three states having some version of this authorization. Most states with this type of authorization limit it by providing that local regulations must be consistent with state laws, or that local regulations can only apply on certain facilities. In twenty nine states, local authorizes are authorized to require the registration and/or licensing of bicycles and are usually explicitly allowed to charge a fee for that registration and/or license. Ohio has an awesome and unique provision in its local regulation law. In 4511.07(A)(8) local jurisdictions are allowed to regulate the operation of bicycles, but are limited to regulations that are consistent with state traffic laws and “no such regulation shall prohibit the use of bicycles on any public street or highway except [on freeways] as provided in section 4511.051 of the Revised Code.” This provision ensures that cyclists may exercise their right to the road throughout the state and prevents inconsistent restrictions on where bicyclists may ride. Ohio also provides an excellent example about how laws that are not explicitly about local regulations may provide important limitations upon local jurisdictions. 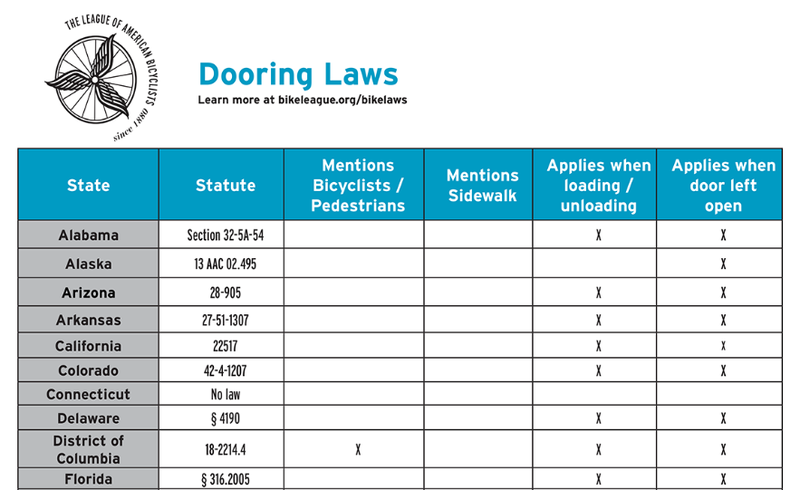 In section 4511.711 the law establishes that bicycles, but not other vehicles, are permitted upon sidewalks. Any regulation of bicycle behavior on sidewalks is left up to local jurisdictions, with the limitation that “no local authority may require that bicycles be operated on sidewalks.” This helps promote uniformity within the state and prevent local regulations that misinterpret the legislature’s motivation to provide rules for bicyclists on sidewalks as suggesting that bicyclists should only use sidewalks. Utah Code §10-8-69 provides that “the governing body of a city or town may prohibit or regulate conduct on a highway or sidewalk if the conduct interferes with or impedes traffic, including: …(d) riding a bicycle or tricycle; or (e) any other conduct or activity that interferes with traffic” unless the prohibition or regulation is inconsistent or conflicts with the Utah Traffic Code. Both of these laws reflect the idea that bicycles are not vehicles, are not a part of normal traffic, but instead are some sort of annoyance or inconvenience to traffic. Both states also have other laws that allow additional local restrictions on bicycles, including the possibility of requiring registration and/or licensing. Together these laws may be used to discriminate against people choosing bicycles rather than other vehicles and the legitimacy of bicyclists using roadways. The authorization of local regulations of bicycles is addressed in the UVC in section 15-102(a)(8). The uniformity of state traffic laws is addressed in the UVC in section 15-101. According to the Pedestrian and Bicycle Information Center in response to the Frequently Asked Question “Are bicyclists allowed to ride on the road?” they say, “Yes! In all 50 states, bicyclists are either considered vehicles or have the same rights and responsibilities as the operator of a motor vehicle.” Case closed, problem solved, why am I still writing this article? The reason that I am writing this article is that because, unfortunately, that’s not the whole story and it can matter — A LOT — whether your state considers bicycles vehicles and/or gives a person operating a bicycle the same rights and responsibilities as a person operating a motor vehicle. It’s been awhile since I updated the Bike Law University series and this subject — how states treat bicycles as vehicles — has been the missing topic for over a year since those laws were added to our state bike laws page. I’m addressing this topic now because I had to update the state bike law page for Illinois. I had to update the Illinois page because they changed their law that gives a person operating a bicycle the same rights and responsibilities of a person operating a motor vehicle. Illinois felt that it had to pass this law because a judge decided, based on its previous law, that a bicycle was not a vehicle and that because of that it was appropriate to dismiss a ticket for a driver who failed to yield to Dennis Jur, who was riding a bicycle, and was killed because the driver failed to yield. In response to this decision, the Illinois legislature overwhelmingly passed “Dennis’s Law” which clarified how bicycles are treated as vehicles. The law was supported by many interests including the Illinois Trucking Association. It is great to see the Illinois legislature act to ensure that their traffic laws protect bicyclists and that the injustice suffered by Dennis Jur and his family does not happen again. The only problem with Illinois updating its law is that the previous Illinois law is substantially similar to laws that exist in the majority of states. If the type of injustice that motivated Dennis’s law can occur in Illinois then there may be little stopping it from occurring in other states with similarly worded statutes, particularly in the 20 states where — like Illinois — bicycles are not vehicles by definition. What occurred in Dennis Jur’s case is emblematic of the complicated nature of how bicycles are treated like vehicles and the many potential pitfalls embedded in the laws that lead bicyclists to “either [be] considered vehicles or have the same rights and responsibilities as the operator of a motor vehicle.” The impact and limitations of these laws can go far beyond whether bicyclists can ride on the road, as discussed below. In the remaining 20 states, the definition of a vehicle either excludes bicycles specifically or excludes human-powered vehicles (including bicycles). In Massachusetts and Vermont my review only found definitions for motor vehicles and there was no definition of a vehicle. Six states do not limit the rights and duties that apply to bicyclists to specific chapters or other parts of traffic law. Two states — Louisiana and Wyoming — suffer from poor drafting or transcription and it is not clear by reading their “rights and duties” statutes that the rights and duties referred to are the rules of the road for vehicles. Illinois prompted this article and it is ostensibly focused on motorist-bicyclist behavior in order to address the fact that the driver who killed Dennis Jur was not even held accountable for a traffic ticket for the most basic offense possible: failure to yield. However, Illinois is also notable for the incredibly problematic decision of Boub v. Township of Wayne, 183 Ill. 2d 520, 702 N.E. 2d 535 (1998) which found that bicyclists are not “intended users” of roadways and that local governments cannot be held responsible for the injury or death of a bicyclist caused by negligent road design or maintenance. Dennis’s law does not necessarily change the decision in Boub as the court in that case found that “[w]hether a particular use of property was permitted and intended is determined by looking to the nature of the property itself” rather than looking at, for instance, the statute that gives bicyclists the rights and duties of people operating vehicles. This case adds an additional dimension to the complicated nature of whether a bicycle is a treated as a vehicle. Every device in, upon or by which any person or property is or may be transported or drawn upon a highway, excepting devices used exclusively upon stationary rails or tracks. Every person propelling a vehicle by human power or riding a bicycle shall have all of the rights and all of the duties applicable to the driver of any other vehicle under chapters 10 [Accidents and Accident Reports] and 11 [Rules of the Road], except as to special regulations in this article [Article 12 – Operation of Bicycles, Other Human-Powered Vehicles, and Mopeds] and except as to those provisions which by their nature can have no application. There is quite a bit of history to whether a bicycle is a vehicle. In the original Uniform Vehicle Code from 1926 the definition for vehicle included bicycles, but then bicycles were explicitly excluded from 1930 until 1975. During that period most states adopted statutes that either explicitly or otherwise excluded bicycle from the definition of vehicle. When bicycles, and other human-powered devices, were excluded from the definition of vehicle they were not entirely excluded from the Uniform Vehicle Code. Instead bicycle got its own definition (1-109) and the UVC introduced a version of 11-1202. That initial version made people riding a bicycle “subject to [the rules] applicable to the driver of a vehicle…” and did not mention any rights for a person riding a bicycle. It was not until 14 years later that the section was amended to make it clear that bicyclists had rights, not just duties. At least two states (Ohio and Kentucky) still appear to only address the duties owed by people on bikes without discussing the rights owed to a person on a bike. Deciding how bicycles should behave with respect to motor vehicles, pedestrians, and traffic rules. Deciding whether a bicycle is defined as a vehicle. Deciding whether a bicycle should be a vehicle can be surprisingly difficult. There are many types of bicycles and types of people who ride bicycles. A bicycle can be a low-speed device used by a child, a high-speed device used by an adult, and anything in between. Increasingly, bicycles now also include electrically-assisted bicycles and, as we reported in our E-bike report, those bicycles have higher average speeds. When a state decides that a bicycle is a vehicle there are at least two major repercussions: 1) laws written to govern “vehicle” behavior presumptively govern bicycle behavior, and 2) rights associated with vehicles also apply to bicycles. Safety issues created by motor vehicles drove the creation of modern traffic laws and states may choose to define bicycles as vehicles because vehicles have the most well developed set of rules for the road. Defining bicycles as vehicles also parallels early legal cases that defined bicycles as carriages in the time before motor vehicles. Defining bicycles as vehicles is also been consistent with the Uniform Vehicle Code, which changed its definition of a vehicle to include bicycles in 1975. States may also choose to define bicycles as vehicles because they recognize that they are unable or unwilling to create comprehensive rights and duties for bicycles as a distinct type of vehicle or device. It’s like when the scientists in Jurassic Park filled in the gaps of dinosaur DNA with frog DNA: States, and the general transportation establishment, only had fragments of an idea about how bicycles should be incorporated into traffic laws and so they filled in those gaps with vehicle rules and hoped for the best. Most states take the additional step to decide how bicycles should behave with respect to motor vehicles, pedestrians, and traffic rules through a separate statute that describes the “rights and duties” of people who bike. This type of statute can be problematic and has numerous forks that can surprisingly limit the rights of people on bikes. The many potential areas for ambiguity or interpretation of the “rights and duties” statutes are of primary concern in the 20 states where bicycles are not defined as vehicles. In five of those states there is no law that specifically deals with safely passing a bicycle, and I have heard anecdotal accounts of law enforcement failing to apply laws governing the safe passing of vehicles for that reason, despite the existence of the “rights and duties” statute that would seem to extend vehicle passing duties to vehicles passing a bicycle. The statute applies only when a bicycle is ridden upon a “roadway,” “highway,” or some other defined area. As discussed in my article on sidewalk riding, many states do a poor job of providing rules for people bicycling on sidewalks or similar off-street paths. When a “rights and duties” statute is limited to a specific type of infrastructure, such as a “roadway” and rules are not clear for bicycles when they are not on that infrastructure it can create problematic situations where it is unclear what rules apply to a bicyclist when on sidewalks, paths, shoulders, or other infrastructure that exists outside of a “roadway” but is often used by people who bike. An example of this type of limitation being used can be seen in Polzo v. Essex (35 A. 3d 653; 209 NJ 51 NJ Supreme Court 2012) where the court found that bicyclists are not owed same duties on a shoulder as they would be on roadway. The statute grants rights and makes people on bicycles subject to duties of a chapter(s), section(s), or other subset(s) of state law. This can introduce at least two problems: 1) the referenced chapter(s), section(s) or subset(s) of state laws create ambiguity regarding how some laws that apply to vehicles apply to bicycles, and 2) the law is poorly worded so that it is unclear which portions of traffic laws are referred to by the law. An example of the first problem is Kansas, where the “rights and duties” statute would seemingly make bicyclists subject to DUI laws, but a court has found that it does not (City of Wichita v. Hackett, 275 Kan. 848 (2003)). An example of the second problem is Wyoming, which states that a person “riding a bicycle has all of the rights and all of the duties applicable to the driver of any vehicle under this act” where the act is a law creating that statute and not the chapter of “Regulation of Traffic on Highways.” This may not be a problem for lawyers and judges, but can be a barrier to the public understanding the rights and duties of people who bike. Dennis’s Law amends Illinois law to include a reference to Article IX of Chapter 11: Rules of the Road, but also provides that rights are not limited to rights found in that chapter. This potentially resolves ambiguity by guiding courts to be apply the principle of the rights and duties statute broadly. The statute creates an exception from certain traffic laws for a person operating a bicycle, in either a general or specific manner. Most often this is done by referencing a chapter, title, or subsection that includes certain rules that the state has decided should not apply to bicycles. These may be laws related to intoxication offenses, insurance requirements, licensing requirements, or other laws that the state has decided to specifically exempt bicyclists from. These exceptions may also be implicit by a state specifying that only a particular chapter applies to bicyclists, with the implication that any other chapters that otherwise apply to vehicles do not. The statute specifies alternative rules that conflict with other traffic laws, and generally are more restrictive than other traffic laws. Bicycle-specific laws are often in conflict with other vehicle laws. Often they are more restrictive, requiring a bicyclist to ride to the right hand side of a roadway or use a bicycle lane where one is provided. A “rights and duties” statute usually specifies that a person riding a bicycle must follow bicycle-specific laws by making an exception to the grant of “rights and duties.” This format also affords the possibility of the creation of greater, or at least different, rights as can be seen in sidewalk riding laws (where vehicles are prohibited from using sidewalks, but bicycles are not). The statute provides a catch-all exception for traffic laws that “by their nature can have no application” or alternative language that provides an undefined exception. As discussed in my article on Bicycling Under the Influence, courts generally do not look for differences in the nature of bicycles and motor vehicles and instead look to the language of statutes and legislative intent when deciding whether a traffic law applies to a person riding a bicycle. One notable exception from case law is New York State Appellate Court, Secor v. Kohl, 67 A.D.2d 358 at 362-3 (1979) which found that a bicyclist was not required to continuously signal before a turn due to the differences in the nature of bicycles and motor vehicles. Another example of this provision being used can be seen in Schallenberger v. Rudd, 767 P. 2d 841 - Kansas Supreme Court (1989), which held that the “rights and duties” statute did not prohibit bicyclists from using sidewalks where bicycle were not defined as vehicles under Kansas law. Since this case Kansas has not enacted a law to clarify the rights and duties of bicyclists on sidewalks, although a more recent case, Kendrick v. Manda, 174 P. 3d 432 (2008) expanded upon Schallenberger to say that bicyclists in crosswalks have the rights and duties of pedestrians. The statute applies only to a person operating a bicycle, and people riding on a bicycle or attached to a bicycle are not discussed. This is common and reflects the background of the “rights and duties” law, which focused on “duties” which govern the behavior of people who bike. However, it may make it unclear how the law should treat passengers on bicycles.